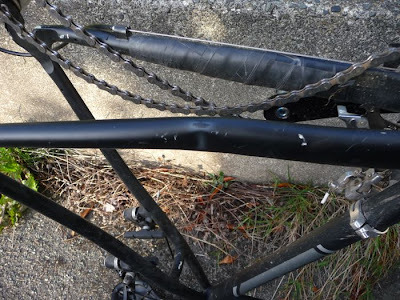 In the second race after buying it, I crashed my Empella Bonfire SL and bent the chain stay. I replaced it with an Everti Ti-Fighter which should be almost indestructible. My friend Sarah shot this video which almost catches my crash. I'm in blue and I do an endo at about 7 seconds. Listen to the crunch. RIP Empella.. What are you doing with it? I guess you could bend it back, and use as a winter bike..? I'm going to make it into a sweet fixie with sweet pink rimz and a plaid top-tube pad.